Style with a softer edge. Clean and timeless, the Essence 7242 is the perfect blend of style and warmth. 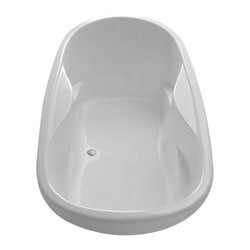 Featuring a spacious deep bathing well for two people, the Essence drop in oval bathtub has plenty of deck space for mounting a faucet and integral arm rests. Includes two pillows. Available as a soaking tub, air tub or whirlpool tub. Call 800-720-1062 for more details.